Here's an interview a few years ago at "Top Hat", a Hawaiian rider who influenced a lot of wave riders (me too). I do not add anything, take 5 minutes and read it. "LesFoilZ.com : Hi Kevin, many thanks for accepting this interview on LesFoilz.com. You are an emblematic rider in kitesurfing, not only because you're in kitesurfing for a long time but also because your are quite an off-the-margins rider (not to mention that you are wearing a top hat). Can you tell us when you entered kitesurfing? How did you come to kitesurfing or maybe how did kitesurfing come to you? What is your home spot? Top Hat:: My life has always revolved around the water and the endless possibilities it offers. , I began surfing in 1966 on the Island of Oahu. While surfing I was often disappointed when the wind would pick up turning perfect surf into chop. I wanted to be in the water all the time so I learned this new sport called windsurfing in the 1970’s. Surfing in the morning, & Sailing in the afternoon was the perfect combination for fun. In During the 90’s I mastered my waterman skills on Oahu’s North Shore. Surfing, Windsurfing, Tow Surfing dominated my life. I even bought a surf shop “HAWAII SURF & SAIL” to support my good habits. Windsurfing the wave at “Backyards” really took a toll on my gear so I started sewing and open a sail loft to repair all the locals destroyed sails. Some of those local sailors turned out to be pretty famous watermen. Buzzy Kerbox, Laird Hamilton, Rush Randle, and Derek Donner. One day in the late 90’s I ran into Derek Donner on the beach at backyards. He had a Flexifoil RAM Air kite that Laird wanted him to try to fly. Apparently Laird had not done so well with flying the kite. Derek told me this as we hot launched the kite. And there went Derek crash boom. He was over it and let me have a go. I will never forget that first hot launch. My feet trenched a 50-foot trail in the sand, Kite straight to neutral, and I knew this was the next level of extreme fun for me. I bought a Flexifoil Kite the Next week. FZ: In a short sequence from the KSP 2012 in Hawaii, I have seen that you are still using a pulley bar with no depower. I remember that you started using this system some years ago together with other riders such as Felix Pivec (now one of the founder of Switch Kites). These riders have now moved on to more "standard" settings and you are still on a pulley bar in waves. Could you explain us this choice? TH: Yes , it is true. I am one of the only people in the world that prefers a Fixed Pulley Bar for kite surfing. Coming from a 2-line foil kite background I have always enjoyed the direct feeling with incredibly low bar pressure a Pulley bar offers. When surfing a wave with a kite I feel it is very important to have a direct yet controllable connection with your gear while still having freedom of movement. The Pulley bar allows me that connection. Controlling the kite, one arm, one hand, is no problem. When riding unhooked this ability to single handedly control the kite combined with traditional surfing technique results in a magical smooth ride where rider and kite coexist in harmony. You can see this technique in action by looking at various media of my riding. Although my friend Felix Pivec does not use a pulley bar he achieves a similar style of kite control using a set up I made for him called a “Fricken Loop “. A Fricken Loop Bar is a permanently Fixed Chicken Loop Bar with no depower where a ring under the bar acts as a safety depower in case of emergencies. Both The Pulley Bar and the Fricken loop Bar are full time fixed with no on the fly depower capabilities. However both Pulley & Fricken Bars do have an adjustable power strap allowing fine-tuning for the sessions conditions. Basically any kite bar can be easily converted into a Fricken Loop or Pulley Bar set up. TH: I have always found that almost any kite will fly on one of my Pulley Bars. It is just some kites fly better than others in the surf. If you tend to fly your kite with one hand unhooked on the wave you are going to need a very responsive controllable kite that sits in the correct position for the type of wave riding you choose to do. The kite really needs to become a direct extension of your body & your body’s movements. Controlling subtle changes in body, board & kite while flowing together in unison with the wave is what I seek to achieve For this reason I always really enjoyed the combination of C kite and a fixed bar. The Airush” Reactors & Generators “ worked great with a fixed Pulley Bar setup. The lack of de-power or just having full power all the time allowed a few of us to ride smaller kites in the surf where maneuverability & precise control was so important. Those C kites worked sweet. As time passed I somehow ended up riding some kites from a guy named EH. It was the complete opposite to the C Kite. Eric H made the flattest kites I had ever seen. They were bridled kites and the question of whether my pulley bar would work on a bridled kite was quickly answered on my first test ride. The combo of the flat kite & the Pulley Bar worked incredibly well. I guess EH quit making kites but I was thankful that he turned me on to those sweet flat kites that reminded me of flying a foil kite back when I first began kite surfing. I still use them. My translator “Mr. 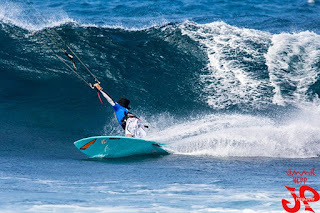 Brunno” recently rode one of my old Ripper 9 “Warning Local” Kites in the in the KSP Maui event. Lately I have been flying a combination of Switch Kites (Which I buy off the website) in both the C shape “Combat “with carbon battens & a bridled “Method” Kite. I have 2 sizes of kites, 5m & 7m that I ride in winds from 7-36 knots. For pure wave riding I now prefer the “Combat” C kite which is basically a highly evolved version of the “Generator “C Kite & for Small or no surf days I find the Bridled Method kite to be very fun on the Pulley. Bar I am always looking to try my Pulley Bar on any Kite. FZ: Did you ever try to fly foil kites in waves? 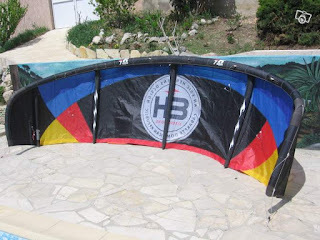 At lesFoilz.com, we think that a foilkite with constant power and speed would be a good companion for nomad free surfers who mostly paddle surf a bit too windy (or want to catch more waves and do some training)? Let's fly out a kite. TH: I started day one riding Foil kites in the Surf. Of course we had no access to inflatable kites until the Wipika’s showed up in the Islands. Even when the Wipikas were available a few of us stuck to our 2-line Flexifoils. Most of my fellow kiters would cut off their brake bridle lines, as they had no use for them on the 2-line bar setup. I preferred to keep my brake lines attached and utilize them for power adjustments. I loved the simplicity of the foil kite but I do not miss the swim in or the repairs. In large surf you had to rescue yourself and your kite or you both sink forever. Swimming in with those was quit a chore. But sort out those lines, a quick hot launch, and your out in the water again. The few things I really do miss about the Foil kites is the steady power, hang time and the little space that they can pack into for travel. To this date I have not yet tried a 4-line Foil kite in the surf but I am looking forward to trying anything. TH: The main characteristic I look for in a board is COST. In the Maui KSP event I rode Bryan Lake’s old 5’8” Tokoro Fish he left in my backyard. I’m a budget-oriented person so I usually ride other people’s old boards or buy a board that is reasonably priced with these characteristics in mind, durability, volume, and performance. I have found that anything can be ridden with a kite & everything you ride with a kite will eventually break. I like to mix it up in the surf so I ride every thing from planks of wood to high performance surfboards. Depending on the conditions you ride the volume of your board of choice can really affect your level of fun I have a belief that if you do choose to ride a surfboard it should be adequately sized so you can actually use it as a surfboard, not just a board for kiting. This is one reason I prefer a traditional surfboard as opposed to a kite specific surfboard. Not to mention the strap inserts on kite specific surfboards add weight & ruin a boards flex characteristics. The true benefit of a properly sized surfboard is the ability to paddle. No wind, no problem, just paddle. Many days when the wind just does not blow or the wind dies when your miles from your launch spot being able to paddle your surfboard can make your day fun. To challenge myself volume wise I do love riding Skim boards and alaia boards but more wind is required & they do not paddle so well. With wind riding a plank in the surf can super rewarding and really helps you to understand the need to control your speed in the surf. Lately I have been riding fish shaped twin fins & regular thruster surfboards which to improve the performance I pull the center fins out and ride as a twin set up. You sure can tell if your thruster is a stud or a dud by pulling that fin out. Without the center fin you end up relying on the boards rail outline & rocker for control on the wave. If you have a good shape you will have a good ride. FZ: In many instances, surfing with a kite seems to be all about turns (and "spraying") --I suspect that this taste has been influenced back in the day when reading paper magazines with only still shots was the main source of inspiration for surfers. In a short sequence of the KSP, some FZ members have noticed that your style is all about flow. Could you tell us a bit more about what you are trying to achieve when you surf a wave with a kite? FZ: Many thanks Kevin for this interview."